Ende 2014 gab es allein in Deutschland rund 25.000 Windkraftanlagen – so eine Statistik des Bundesverbands WindEnergie. Unter anderem durch die Windkraft soll der Atomausstieg vorangetrieben werden. Doch nicht jeder freut sich über die spargeligen Windräder, die mittlerweile nicht nur zu hunderten auf Feldern und Hügelgruppen entstehen, sondern auch immer öfter in Wäldern. Das belegt eine aktuelle Emnid-Umfrage. Zu den Ergebnissen und der Auswirkung der Windkraft auf die Natur berichtet Helke Michael in einem Audiobeitrag, der im Juli 2015 von der Deutschen Wildtierstiftung zur Verfügung gestellt wurde. Zum Beitrag geht es hier (“Medium 1″). Sprecherin: So Professor Fritz Vahrenholt vom Auftraggeber der Umfrage, der Deutschen Wildtier Stiftung. Und der Schutz von Vögeln ist dringend notwendig, denn sie reagieren sehr sensibel auf Windkraftanlagen. Sprecherin: Und auch Fledermäusen werden die Windräder zum Verhängnis. Jeder Jahr sterben in Deutschland 240.000 Tiere aufgrund des Unterdrucks, der durch die Anlagen erzeugt wird. Tatsachen, die man nicht ignorieren kann. Die deutschen zeigen in einer aktuellen Umfrage ein Herz für Wälder. Jedenfalls lehnen es 79 Prozent der von Emnid befragten Bundesbürger ab, dass für den Ausbau der Windenergie Waldgebiete verschwinden oder zerschnitten werden. Auch schanzer-leben.de berichtete (“Emnid-Umfrage belegt: 79 Prozent der Befragten lehnen Windkraft im Wald ab“). In both my opinion and experience, this book is by far the best book I have encountered and read on the issue of climate change and anthropogenic global warming. Anyone interested in this topic should read a copy. It’s that definitive. The book is a translation of the German version, Der Kalte Sonne, published in 2012. Thus, some of the policy discussions are set in a German context. They do provide a glimpse of what could happen if similar policies are adopted elsewhere as one sees today in the UK. 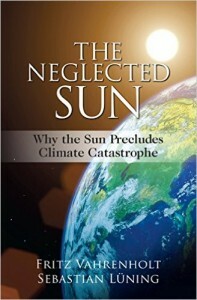 The sun, including its magnetic cycles, and inner dynamics, exerts the major control on climate variability and climate change. Six different cycles of solar activity are documented. The climate history of the earth, including the last 150 years, correlate closely with these cycles which range from 11 to 2300 years. Moreover, some are amplified long term by Milankovich orbital parameters. The current temperature “Pause” is explained in terms of solar cycles and decreasing solar radiation. Likely, a period of cooling is ahead as solar radiation entering a diminished phase. Chapters 5 (Has the IPCC really done its homework? ), 6 (The misunderstood climate amplifiers), and 7 (A look into the future) provide the most detailed and accurate critique of the UN-IPCC’s reports I have read (I call it a withering dissection). Thus, projected future temperature increases are expected to be much less than the UN-IPCC infers and the climate ‘crisis’ is overblown far too much. These chapters are incisive. The last two chapters deal with German climate and energy policy. They are instructive because the policies are failing, particularly as electricity costs have skyrocketed since implementation. This is becoming a universal problem. A trivial (or perhaps not) fact I did not know. Before Angela Merkel became Chancellor of Germany, she was the minister of the environment. It appears she was co-opted by the green movement well before her rise to global prominence. Summary recommendation: Buy this book. Our future may depend on it. ABOUT THE AUTHOR: George Devries Klein is a geologist who earned his MA from the University of Kansas and his PhD from Yale University in that field. He worked for Sinclair Research, Inc., and taught at the Universities of Pittsburgh, Pennsylvania and Illinois @ Urbana Champaign. He is now Professor Emeritus, Geology, University of Illinois @ Urbana Champaign. Between 1996 and 2014, he was president of SD-STRAT Geoscience Consultants, Inc, a geological consulting firm in the petroleum field. He is now retired in Guam.